Lithium-oxygen and lithium-sulfur batteries have the potential to revolutionize the energy storage market, since they can in principle store >5 times more energy than the current lithium-ion battery technologies. 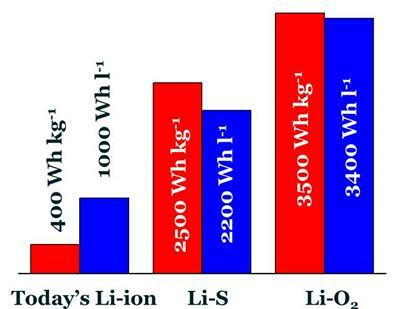 However, the performance of Li-O2 and Li-S batteries is currently limited by several fundamental issues. where EtV2+ acts as an homogeneous catalyst and it is not consumed in the reaction. Furthermore, EtV2+ also acts as an electron shuttle, preventing electrode passivation by displacing the location of the reduction of oxygen from the electrode surface to the solution. Indeed, a major increase in capacity is obtained upon addition of EtV2+ to a Li-O2 cell. Unfortunately, ethyl viologen also has some shortcomings, and we are currently investigating alternative redox mediators to aid not only the discharge, but also the charge reaction of Li-O2 batteries. The reactions are characterized by electrochemical measurements as well as in-situ and ex-situ characterization techniques such as mass spectrometry, Raman spectroscopy and X-ray diffraction. We hypothesize that polysulfides can act as redox mediators and shuttles in Li-S batteries, and their action can be optimized via a selection of suitable electrolytes. Unfortunately, very little is known about the nature and concentration of polysulfides formed during the operation of Li-S batteries and new methods and techniques are required to shed light into the reaction mechanism. We have recently developed a new method that allows predicting the equilibrium concentration of polysulfides in Li-S cells, as well as the theoretical electrochemical response of the cell as a function of the amount of electrolyte. This new approach is based on the construction of an experimental phase diagram, and it is used for the rational screening of electrolytes for Li-S batteries. The work is supported by a range of analytical techniques and fundamental electrochemical studies. Financial support from EPSRC (EP/M50662X/1, EP/N024303/1, EP/L019469/1, EP/P019099/1), the Royal Society (RG130523) and the European Commission through the FP7-MC-CIG FunLAB project (630162) are gratefully acknowledged.